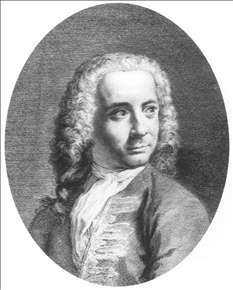 Italian painter, engraver, architect and theorist. He trained with Giovanni Antonio Pellegrini and was first mentioned as a painter in 1711. 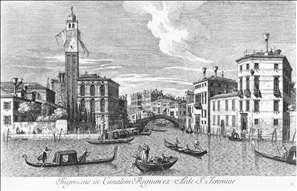 Visentini first earned fame with a volume of his drawings engraved by Vicenzo Mariotti (d 1734), his own work as an engraver dates from the end of the 1720s, when he was commissioned by Joseph Smith, with whom he had been in contact since 1717, to produce engravings of Canaletto s views of Venice; they were published in Prospectus magni canalis Venetiarum (Venice, 1735). 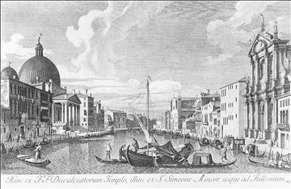 From 1735 to the 1750s Visentini worked as an engraver. Vignettes and illustrations by his hand are to be found in many publications. 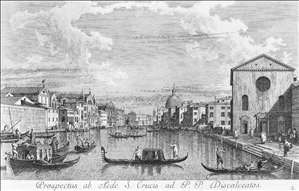 See more details about "San Geremia and the Entrance of Cannaregio"
See more details about "The Canal Grande from Santa Croce to the East"
See more details about "The Canal Grande with San Simeone Piccolo and the Scalzi"
See more details about "Portrait of Giovanni Antonio Canal, called Canaletto"